Satisfy customer requirements while maintaining optimal inventory levels using the powerful Acumatica Manufacturing Edition MRP planning tool. Generate time-phased manufacturing and purchasing plans for optimal inventory availability tied to forecast and customer demands. Reduce inventory while improving customer service and avoiding shortages. Why Cloud ERP for SMB Manufacturers? 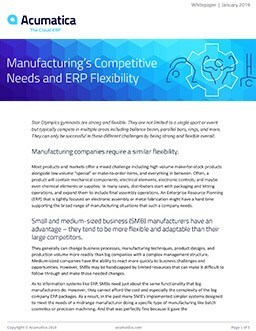 New white paper explains how to keep your manufacturing as flexible as an Olympic gymnast as you battle larger, better-funded competitors. View all supply and demand. Create production and purchase orders directly from the planning screen. Use full multi-level planning to ensure that all requirements are recognized and satisfied for smooth production operations. Enhance your manufacturing resource planning by planning every requirement for every item. Acumatica MRP does not ignore detail by grouping requirements together. Managing distribution software and manufacturing software is time-consuming. Aktion Associates, along with Acumatica, understand what your distribution management system and manufacturing operations management IT needs are, and meets them. With a trusted IT advisor, your time – and focus – can shift from this management necessity to the important task of growing your business. Work through the list of recommended actions – expedite, defer, or cancel supply orders – to keep your plant running smoothly and ship customer orders on time. Identify late orders and display any transfers available from another warehouse or site. Drive your plan and your plant from the Master Production Schedule (MPS). This MRP ERP system plans all requirements based upon MPS. The MPS will be treated as a pre-planned production order and will act as a supply for other demand requirements. Develop forecasts to drive the master schedule from sales history and/or entered manually. Review and execute the complete material plan through MRP screens that show all activity, orders, requirements, balances, and recommendations for an inventory item.